Tragedy Gives The Hoodie A Whole New Meaning When Trayvon Martin slipped a sweatshirt over his shoulders that fateful February night, he was probably just a little bit chilled. But since he was shot and killed that simple piece of clothing has taken on big symbolic weight. James Gilchrist of Orlando, Fla., attends a rally for slain teenager Trayvon Martin in Sanford, Fla., on Thursday. Trayvon was wearing a hoodie when he was shot. 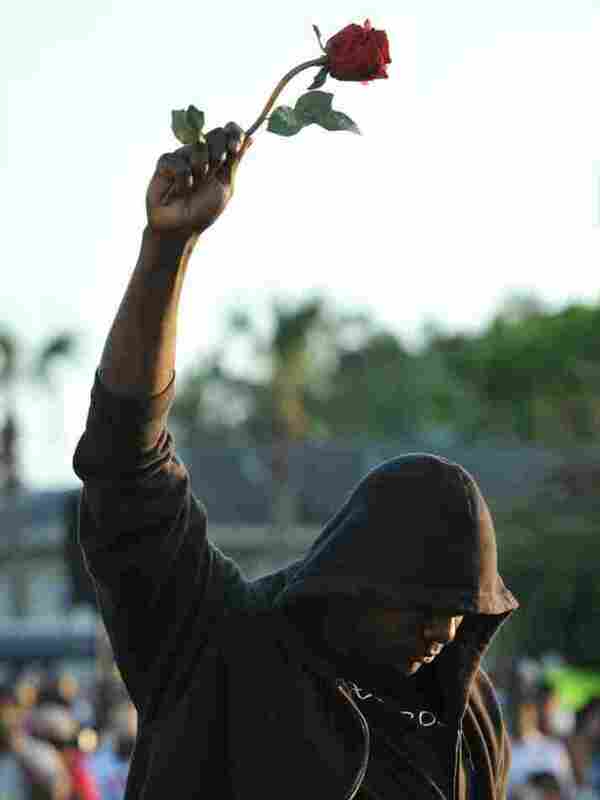 From the tragic death of Trayvon Martin, a symbol emerges: the hoodie. A simple hooded sweatshirt has become emblematic of certain assumptions in America. And of a desire by many to overturn those assumptions. To a neighborhood watch volunteer in a Sanford, Fla., gated community, the young man in "a dark hoodie, a gray hoodie" was a "suspicious guy." That's what George Zimmerman told the 911 dispatcher before he shot and killed the 17-year-old. Zimmerman, 28, says he acted in self-defense; he has not been charged with a crime. On Friday, Geraldo Rivera said on the Fox & Friends TV show that "the hoodie is as much responsible for Trayvon Martin's death as George Zimmerman was." Rivera warned parents not to let their children wear hoodies — unless it is raining or they are at a track-and-field event. He said it sends a sinister signal. "You cannot rehabilitate the hoodie," Rivera said. "Stop wearing it." But supporters of Martin and his family are saying the opposite. As a sign of solidarity, a number of Americans are donning hoodies and marching. "We are all ... Trayvon Martin," they chant. Hundreds of supporters walked in a Million Hoodie March in New York earlier in the week. On Saturday, another group plans to rally in Washington, and gatherings have been scheduled for other cities, too. On Facebook, Twitter and other sites, folks are posting self-portraits with hoodies as a call for justice in the Martin case. 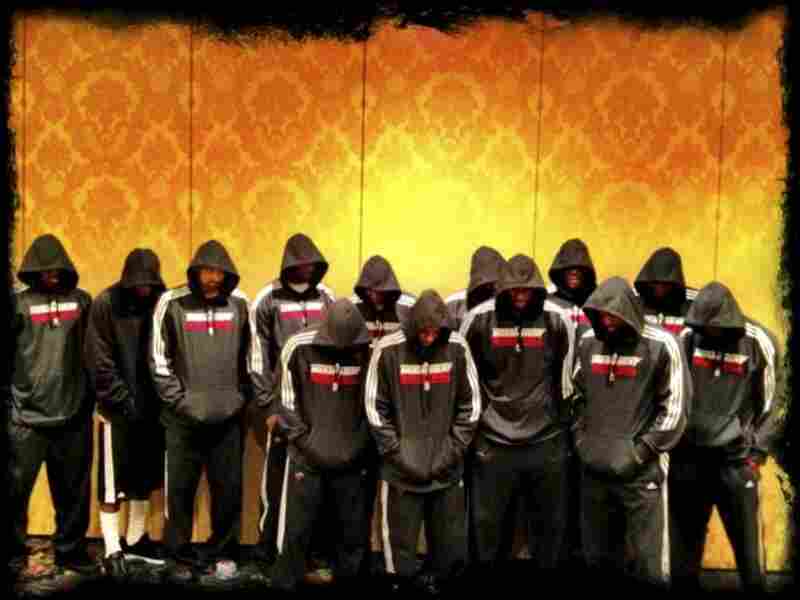 The Miami Heat basketball team posed in hoodies. So did Marian Wright Edelman of the Children's Defense Fund and former Michigan Gov. Jennifer Granholm. "The hoodie is a way of expressing support for the Martin family," Granholm says in an email, "and for all the sons of African American families who bear the heavy burden of other people's negative assumptions." And so the hoodie, considered by some to be suspicious attire and by others to be benign, becomes a wearable Rorschach of contemporary American culture. It's tough to find an American closet that doesn't have a hoodie hanging there. Send a search engine out into the ether seeking images of people wearing hoodies, and it will bring home photos of tastemaking celebrities Selena Gomez, Rihanna, Zac Efron, Avril Lavigne, Bill Cosby, Muhammad Ali and many others, as well as various athletes, college kids, blue-collar workers and, yes, criminals. When Eminem appeared at South By Southwest recently, he was wearing a hoodie. Mark Zuckerberg of Facebook fame often rocks a hoodie. So does Christina Aguilera. Miami Heat players wear team hoodies in this image posted to LeBron James' Twitter page. NBA stars Dwyane Wade and James decided Thursday to make their reactions to Trayvon's death public. Some hoodies have zippers, some have drawstrings, all have the cowl-like hoods. And it is the hood — providing a shadowy cave for the face — that makes the sweatshirt distinct. Hooded figures, from the innocent Little Red Riding Hood we meet as children to the Grim Reaper we meet later, strike an ancient chord within us. "The hoodie has had a long and tortured history," Elizabeth Flock writes in The Washington Post. She traces the present-day look back to medieval monks. When they were introduced into American fashion, hoodies were worn mostly by laborers as protection from the cold. Boxers wore hoodies; so did blue-collar workers. Margaret Atwood's classic 1985 novel, The Handmaid's Tale, had a very striking figure on the cover, wearing a hood — a key signifier of oppressed women in the story. If the hoodie catches on as symbolic of an issue, it will not be the first time that a movement has adopted a recognizable representation. During World War II, the simple paper clip — a version of which was patented by a Norwegian man in 1899 — worn on the lapel became a symbol of solidarity and resistance among citizens in Nazi-occupied Norway. In Poland, people — forbidden to wear red-and-white Solidarity buttons — donned necklaces made from electrical resistors as high signs to one another. During the Occupy movements of recent months, participants have sported grinning Guy Fawkes masks — made popular in the movie V for Vendetta — as symbols of unity. Scores of organizations in this country and elsewhere use ribbons, pins, buttons and bracelets to help supporters identify each other. There are many examples of clothing being used as a symbol throughout American history, says Joshua I. Miller, a professor at Lafayette College in Easton, Pa., who has written about the politics of fashion. "The dress in Mad Men, now ubiquitous, symbolizes cultural trends in white suburban America in the '50s and early '60s." And perceptions of clothes can change. Former Michigan Gov. Jennifer Granholm is one of a handful of celebrities who've donned hoodies in support of Trayvon's family. In fact, Michael Thomas Mills, a semiotician at the University of Northern Colorado, says that he first recalls hoodies popping up in positive ways, such as when the fictional boxer Rocky and other athletes-in-training wore them. But Mills says hoodies have been used by various groups as shorthand for ominous behavior. Hooded sweatshirts often suggest "negative and damaging stereotypes," Mills says, "and are so prevalent in the media that many individuals, especially those not from urban settings or where there is not much ethnic diversity, learn through the media to associate the clothing with a type of individual or situation." He says the depiction is frequently trotted out, for instance, in ads for home security systems. "Often hoodies will be used to suggest sinister motives," Mills says, "usually with the perpetrator pulling the hoodie over his head before entering a house." Mills cites another sartorial metamorphosis: The classic sweater thrown over the shoulders and tied at the chest has long been associated with country clubs, wealth and influence, Mills says, but now the look is "usually a negative sign about elitism." Bluejeans, once seen as Western working wear, became the chosen pants of '60s protests. Now bluejeans are so accepted that presidential candidates wear them on the campaign trail. And so, people wearing hoodies to honor Trayvon Martin are trying to turn the negativity toward hoodies inside out. Could such a sea change possibly work? Could it be the more that different kinds of people wear hoodies, the less the sweatshirts will be revolting to the Geraldo Riveras of the world? Could the Wear-a-Hoodie Movement really alter the way that some Americans look at other Americans? And, one last question, could a sweatshirt designed to enclose and envelop be a catalyst for more openness and more meaningful dialogue?